This is a simple game, all you have to do is describe a Copy Ability that Kirby gets by swallowing something specified by the previous poster, and then name a thing that Kirby eats for the next poster. The only rule is that you do not respond to your own post (and follow forum etiquette of course). Kirby gets the Wheel ability. Kirby gets the Light ability. Note that the Abilities do not have to be ones already established in-game. Use your imagination. Kirby swallows a fire hydrant. Kirby is now Water Kirby. Kirby is now Laser Kirby. Kirby swallows a set of earbuds. This message got destroyed by mike kirby. Kirby got Mix ability, which resulted in Sleep ability. Kirby gets the Bubble Ability. He regains 50% of his health/ he becomes cook Kirby. Kirby re-appears with the Hypernova ability. Kirby becomes either Jet Kirby or UFO Kirby. Kirby swallows my Nintendo Switch. 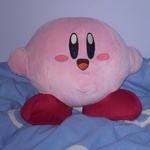 Kirby also swallows the metamato, so he turns into yarn. Kirby gets the Spear Ability. Kirby swallows a light switch. Kirby gains the Spark ability. Kirby becomes Ice Climber Kirby! Kirby inhales 100 enemies in Blowout Blast.